This book was first printed in 1985 in nice hardback cover. Ewing was the president of the Evangelical Church Alliance and pastored in Ferndale, Michigan. 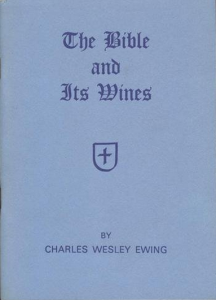 The preface to the book is done by Earl Dodge of the National Prohibition Party, Denver, Colorado. My copy was signed by Dr. Dodge to my father-in-law, Dr. Peter Slobodian. This book first piqued my interest in the two wine view by giving good historical and practical information about ancient wines.